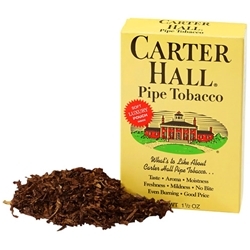 Carter Hall Pipe Tobacco, is a distinguished pipe tobacco mixture, containing cross-cut Burley with Virginia flakes. Carter Hall is not a complex blend, there's no surprises here. Conveniently packed in a box of six 1.5 oz. resealable pouches, Carter Hall pipe tobacco provides superior consistency, ensuring your smoking pleasure every time. Manufactured By: John Middleton, Inc. Still an American favorite, if you want a mild burley tobacco at a low discount price, Carter Hall is the perfect brand and Smokers Discounts is the right store. For questions and inquiries, call our customer service today.